TADA! 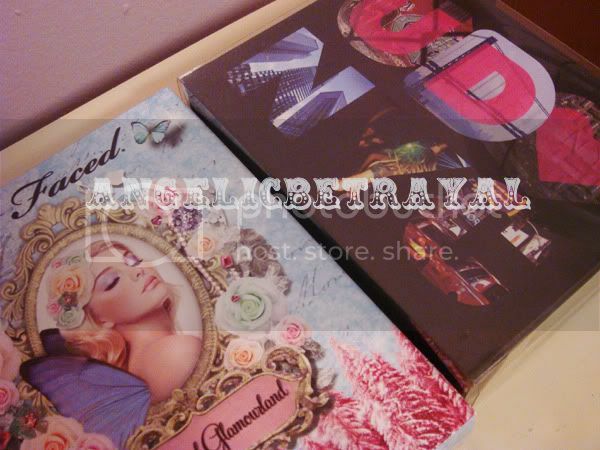 I got both of the palettes which I compared in a previous post but I helped my friend order the Urban Decay Palette so I only got the Too Faced Enchanted Glamourland palette :) The sizes are about the same as you can see in the picture. The Urban Decay Book of Shadows is the same size as the previous years' but about a centimeter thicker because of the built in light up mirror thing. 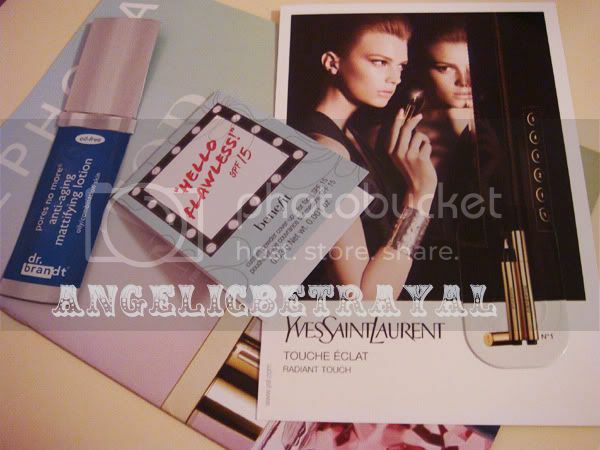 Those are the three samples I received with my order and a little pamphlet with perfume peel-y samples :) I added these to my stash of samples and unopened products which I will probably do a post on sooner or later. Isn't it GORGEOUS? I love this packaging so much more than Urban Decay's packaging (I have the Book of Shadows II). 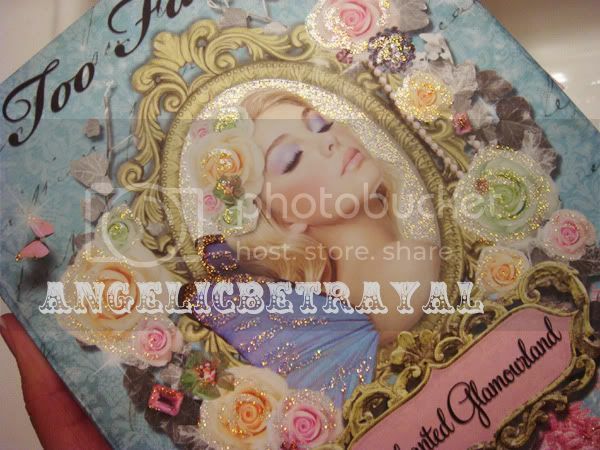 This Too Faced palette is sparkly and shimmery and the glitter is sealed in with glue so it does not transfer onto your hands when you play with your makeup! When you flip open the magnetic closure you get a popup book :) To the left are some look cards and on the right you have your blush and bronzer! 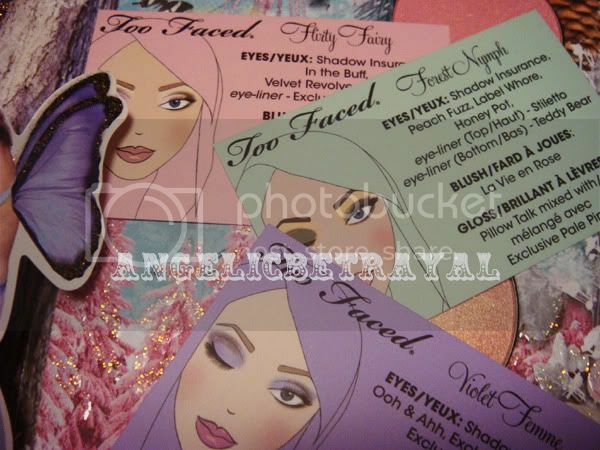 The look cards are pretty useless to me but they're still an adorable touch and it follows suit with Too Faced palettes. The blush and bronzer are a decent size and they're really wearable colors. The bronzer is more of a highlight I'd say and it's really shimmery so I don't think I'd be contouring with it. The bronzer is really golden so I think I'd use this more in the summer months but who knows :). The pink is shimmery with a pinch of peach thrown in. I love blushes like this so I'm glad this was included! Open the drawer on the side and TADA! You get a full sized lipgloss, shadow insurance, and 15 lovely eyeshadow shades that actually have more product per pan compared to the Urban Decay Book of Shadows. 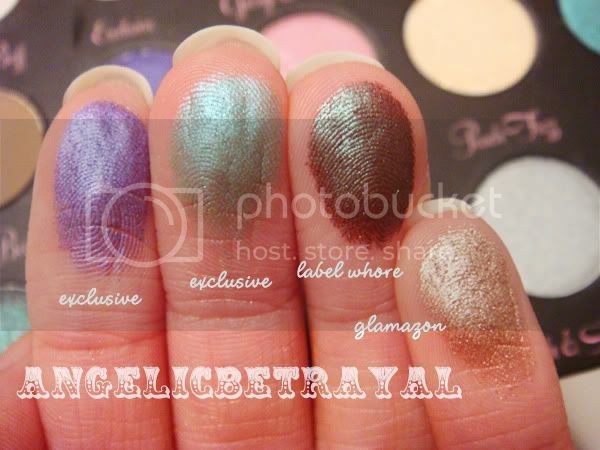 In the midst of my excitement I swatched the shadows out of order but I labeled them :) There are five matte shades and the rest are glittery or shimmery although they do not produce a lot of fallout. You get a good number of neutral shades to work with and a few more bright colors. 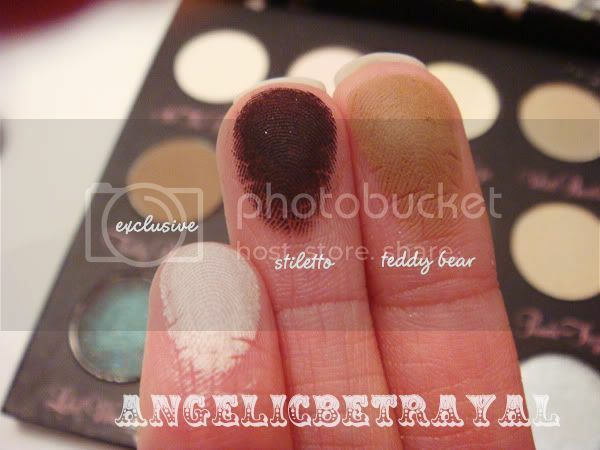 There are three shades which are just labeled "Exclusive" as they are exclusive only to this palette. A lot of the other shades have been released with the other palettes that Too Faced has come out with over the years. Label Whore and Glamazon were two of the shades I was most interested in because Label Whore is a brown with red and green undertones (so unique!) and glamazon is a shimmery champagne, taupe color which I adore. Both did not disappoint! 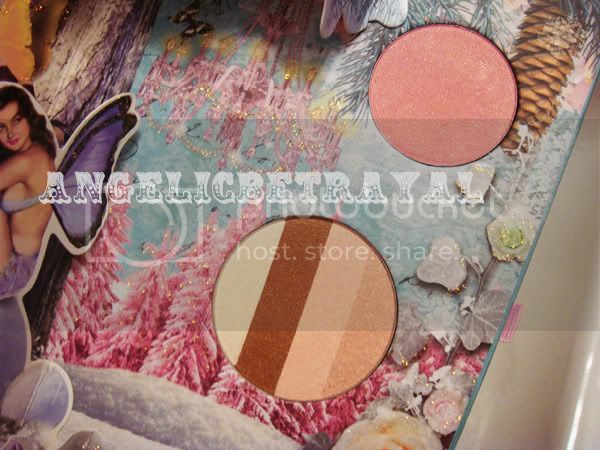 :D Both of these colors were also featured in last year's Holiday palette as well. 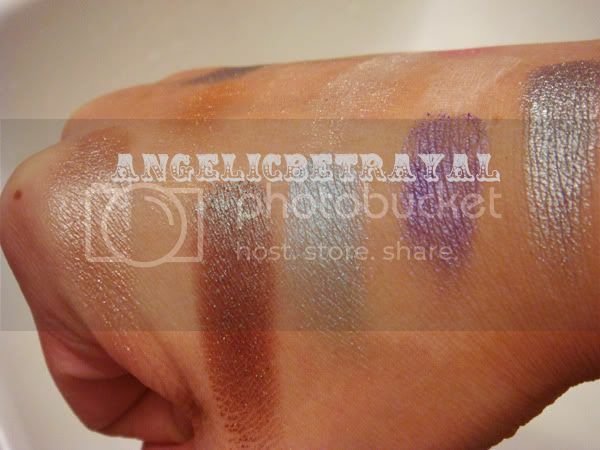 I think I may have swatched In The Buff twice and I labeled the left shade above as the exclusive color or maybe I swatched the exclusive color twice.... Anyways, they're almost the same but In The Buff is more pale and yellow whereas the exclusive shade tends to lean more to the pink side. 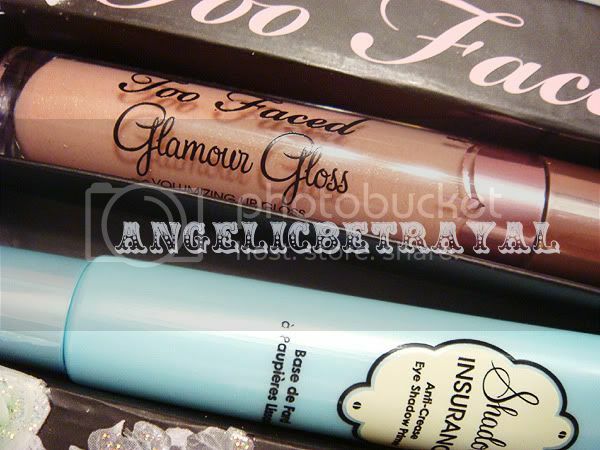 I have the Urban Decay BoS III but I'm thinking about picking up the Too Faced Glamourland palette too. 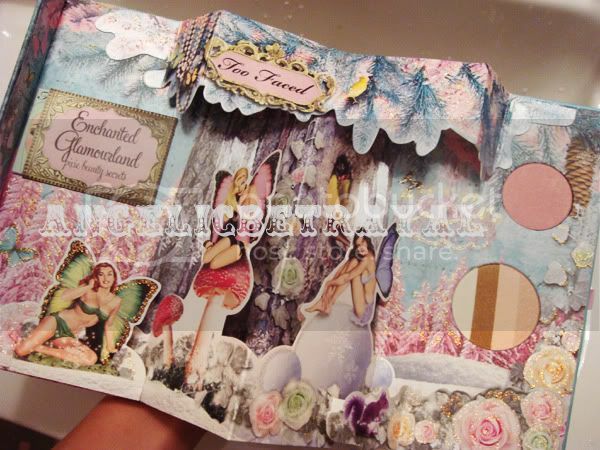 Honestly, I bought the UD BoS because of all the hype and packaging but the Too Faced palette looks so much cuter! 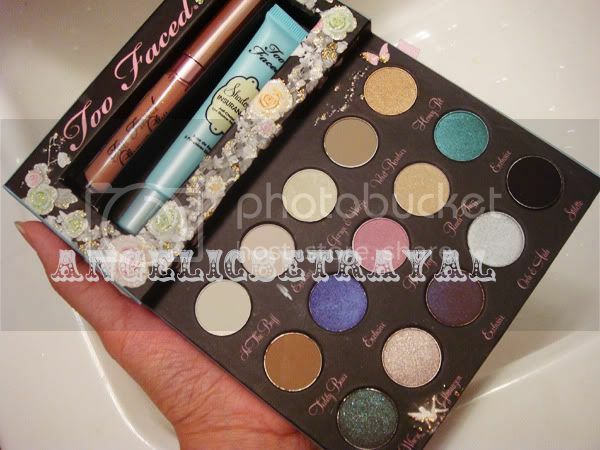 oO I bought the UD BoSIII, though I confess I like it a lot ^_^ the Too Faced palette looks quite pretty too. 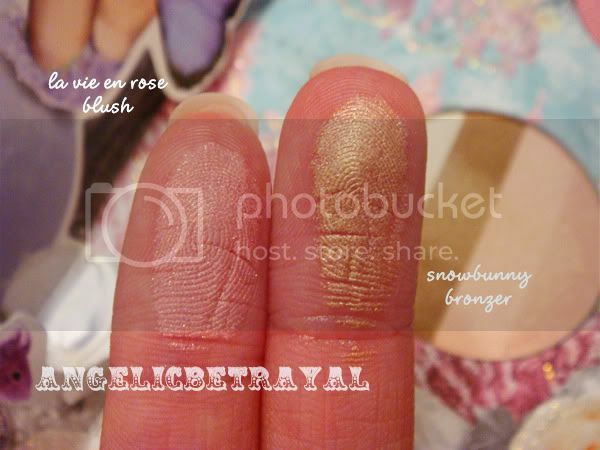 LabelWhore looks awesome, I've never seen a brown shadow with a glint like that! Oh my goodness this palette is absolutely GORGEOUS. My boyfriend bought this for me as an early Christmas gift from the FF sale too, but I can't play with it until December lol. 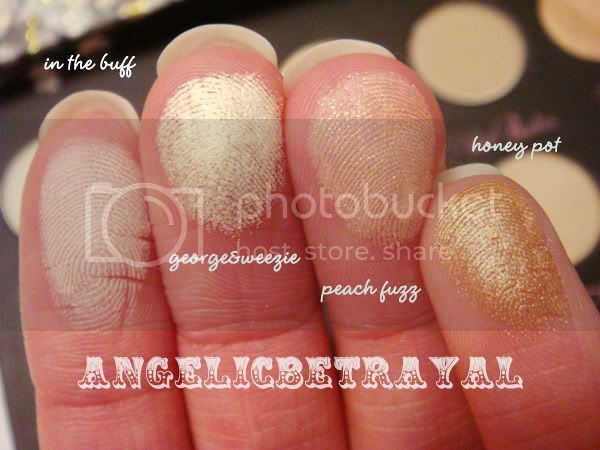 Thanks for all the amazing swatches and reviews! SOO can't wait to get my hands on this! linda: Aw, your boyfriend is so sweet :) Hope you love your palette once you get to open it! Wow, nice haul ^^ In the Buff, George&Weezie?, Honey Pot, Teddy Bear, and Stiletto look like shades from the Wet 'n' Wild Vanity palette!